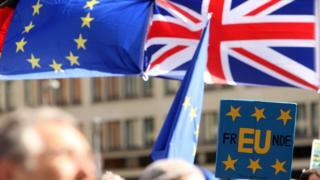 Image caption In Berlin on Sunday, demonstrators held aloft EU and UK flags - and the German word for "friends"
The EU is closely watching the indicative votes process in the UK parliament today. EU leaders would, of course, welcome a softer Brexit. It would ease friction in post-Brexit EU-UK trade relations – but at the same time, they believe MPs are out of touch with reality. Any other form of Brexit requires the much-disliked Withdrawal Agreement - rejected once again by MPs on Friday - to be passed first. The EU is prevented by law from negotiating future trade relations with an existing member state. That is why the UK needs to leave first in order to start these negotiations. EU leaders understand the reluctance of MPs to enter into a so-called "blind Brexit", where you don't know what the future holds. The political declaration document, accompanying the Withdrawal Agreement, is there to give an idea of what might come next. The key word is "might". Yes, if MPs unite around a softer Brexit and if Theresa May accepts that wish and communicates it to the EU, Brussels says it can amend the political declaration in a jiffy. But - and this is where the EU believing MPs are out of touch with reality really kicks in - the political declaration is just that: a declaration. So a future UK prime minister could opt for a very different Brexit when trade negotiations actually start. Which is probably why one of the options being put forward to be voted on today (from Conservative MP Ken Clarke) reads: "Make it UK law to negotiate a customs union with EU". Mr Clarke is seeking to restrict the power of the future prime minister to row back on parliament's will if MPs unite around a softer Brexit. But time is running out – again. The EU has given the UK until 10 April, when it will hold an emergency Brexit summit, to decide what next or to slip - however unintentionally - into a no-deal Brexit. On Monday, European Commission President Jean-Claude Juncker said EU patience was running out. It's hardly a surprising comment, nor the first time an EU leader has said something similar. But it goes without saying that the EU wishes MPs had done their Brexit soul-searching, decision-making and recognition of impending trade-offs long before now - the 11th, 12th, or 13th hour.